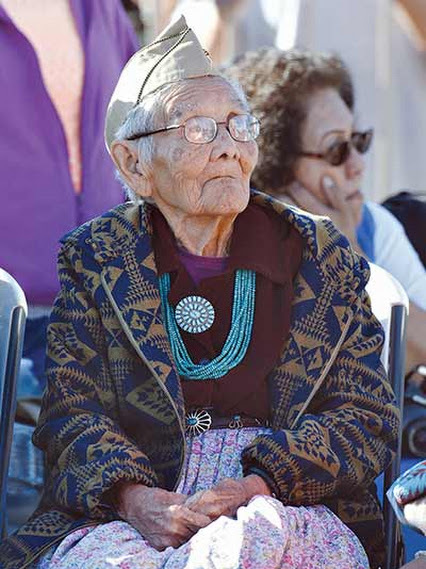 At the age of 102, Sophie Yazzie continues to do things she feels are important, which is why she was in Sacaton, Ariz. over the weekend helping to commemorate the raising of the flag over Iwo Jima during World War II. 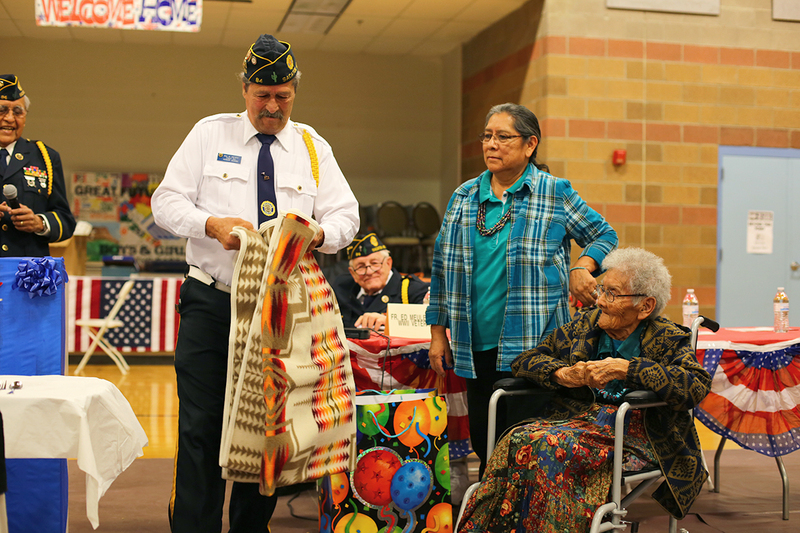 It was Ira Hayes Day on the Gila River Indian Community but Yazzie made an impression to many in attendance by her participation as the oldest living veteran of World War II to attend the event. World War II veteran Sgt. 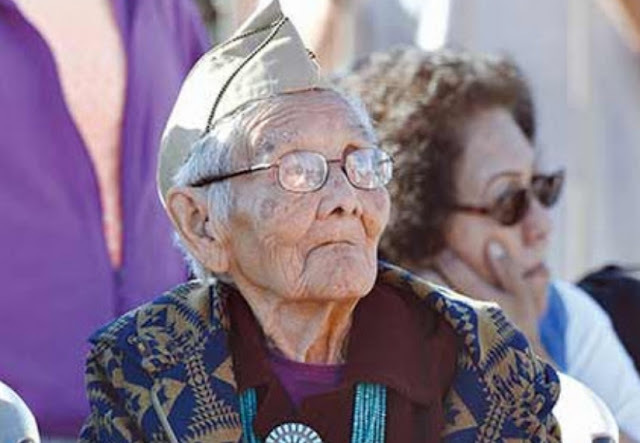 Sophie Yazzie, who is now 102, is showed here in 1945 in uniform. She also had that same honor the year before when she attended the event. A member of the Woman’s Army Air Force Corp, Yazzie has shown over the past several decades that the two things she most cares about – her family and her pride in being a veteran – are something that she will go out of her way to celebrate. When she had her 100th birthday, it was celebrated at the Wheatfields Chapter House to accommodate her four children, five grandchildren and six great-grandchildren as well as the more than 140 friends and community members who wanted to be on hand to celebrate this occasion. “She’s still active,” said her daughter Kathleen Lampert, adding that although she has to use a walker to get around. Her mind is still sharp and when she was interviewed by phone Tuesday night, she remembered minute details of her life on the reservation, in boarding school and in the service. Responses to "At 102, Navajo Family Matriarch Continues to be a Proud Veteran"
Much respect to you my dear one. Be so proud...you've earned it! Sophie, thank you for your service. I find it amazing that a lot of times when Veterans are mentioned everyone go straight to men. We had a veterans' day program at the school where I volunteer and there was not one woman present. I know they should of been represented because women have always supported our country one way or another. I am so glad you are still Sophie and are representing not only hour heritage but women in general. Thank you. @Karen, we are a proud race and our sons, grandsons, daughters & granddaughers serve in our country because this is our home. Although we lost many wars to immigrants now claiming this country, in our minds we are home and will protect it with the help of many now living with us. This is just a small part of why we serve our country. Thank you for your response Rita and I have to say, you are so much bigger than most people in the world and I give a deep bow. The actions and words coming from Native Americans at Standing Rock too are an example and great teaching for those who would care to pay attention. What a wonderful and inspirational lady. Long may she continue to enjoy the things that are important to her. Wishing many blessings upon her and her loved ones. Thank you and I'm proud of you! I salute a great Warrior a true Native of this country that was taken from her people she still went to war to protect and defend. I salute all Native Warriors veterans of foreign and domestic wars may the Great Spirit protect you Forever.